Fixing leaks here can be good for your bottom line as well as the environment. The New York Times this morning reports on the EPA’s Natural Gas STAR program for reducing methane emissions, mainly at the wellhead, refineries and through transmission and distribution channels. Methane, the primary component of Natural Gas, is believed to be responsible for 1/3 of the effects of global warming. While scientists believe that curbing methane will have immediate benefits for the environment, participating companies have found it to be good for their bottom line as well. With Natural Gas prices approaching $5 per MCF, participating companies are seeing returns equal to 3 times or more of their investment to curb leaks. It’s easy to see how. At today’s prices, eliminating a small 1 cfm leak would save $ 2,600 in natural gas each year. That’s about the leakage rate for a 1/16″ hole on a pipe running at 40 psi. When checking for leaks, don’t forget to look into vent lines. 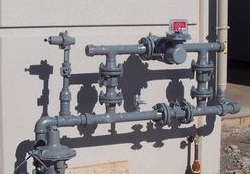 A leaking valve or regulator here could be sending thousands of dollars a year out your stack. The EPA has some cool video of IR cameras being used to quickly pinpoint leaks in large piping systems. However, with gas sniffers available for as little as $50 , fixing one leak would pay for equipping every supervisor, maintenance tech, and engineer in your plant with one. [New York Times] registration required. PilkoTech.com by Pilko Technology Associates, LLC is licensed under a Creative Commons Attribution-Noncommercial-No Derivative Works 3.0 United States License. Based on a work at pilkotech.com.Other content is used with the permission of the original copyright owner.